With an average of 7 to 8 hours sleep per day, we spend a third of our lives asleep. And yet sleep has turned into a nightmare for one out of two French people, who consider they lack it. Ophélie Meunier and the crews from Zone Interdite set up their cameras in the bedrooms of those French who sleep badly for an astonishing glimpse into the depths of our nights. We are going to bed later and later, often with our eyes glued to our screens: almost half of us use a computer, tablet or smartphone in bed! We have lost 1h30 in sleep in 50 years. And yet sleep is a vital necessity. It’s often when we lose it that we realize how precious it is. 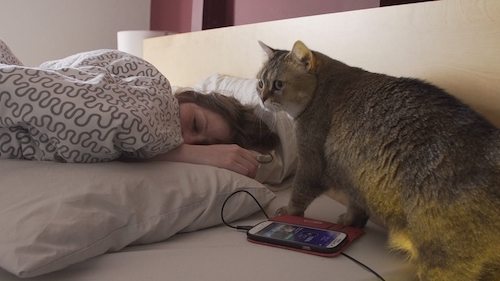 At age 34, Aurélie has never really experienced the joy of a good night’s sleep. An insomniac since childhood, she spends her nights pacing around her apartment. She will test one of the latest high-tech inventions for recovering sleep. With what results? As for Camille, she has never quite woken up. This young 28-year-old sleeps on average 15 hours per day: a mystery to doctors. Her strange condition is a serious handicap in her social relationships and her professional life. After 10 years of fruitless treatment, she will spend 48 hours in the sleep pathology department of the Pitié-Salpêtrière Hospital in Paris, in order to obtain a precise diagnosis and appropriate treatment. Gérard and Adeline spend extremely restless nights. Sleepwalking, night terrors… They describe their dreams in spectacular fashion. And that means no rest for their partners! We now know that 80% of our dreams have a negative or violent content. In our society, we often consider sleep to be a waste of time. With stand-up comedian, Kheiron, a happy insomniac, you will discover that this is far from being the case. Sleep science is booming. Thanks to it, we are discovering the astonishing powers of our bodies. During an experiment conducted by the military, you will see that it is now possible to push back the limits of fatigue. And hypnosis¾a state of modified consciousness between waking and sleeping¾allows us even to put our pain to sleep! Original contributions, spectacular experiments, what is the purpose of sleep and, most importantly, how can we sleep better? Revelations on the mysterious world of our nights.